The storm that killed as many as six people in Haiti and forced the delay of the start of the Republican National Convention in Tampa is on track to hit the Gulf Coast and possibly New Orleans, forecasters said late Sunday. Tropical Storm Isaac, with sustained winds of 60 mph, lashed the Florida Keys and is expected to intensify, gaining strength as it moves into the warm waters of the Gulf of Mexico, and make landfall on Tuesday as possibly a Category 2 hurricane. The projected track and timing is eerily similar to Hurricane Katrina, which devastated New Orleans and the Gulf Coast in late August 2005. Louisiana Gov. Bobby Jindal declared a state of emergency and ordered voluntary evacuations of more than a dozen parishes. Governors in Alabama and Mississippi did, too. "I know the anxiety level is high," New Orleans Mayor Mitch Landrieu told CNN on Sunday. "The storm is somewhat uncertain. Out of an abundance of caution we will begin to take these precautions as quickly as we can." Landrieu added: "We are much, much better prepared structurally than before." Hurricane warnings have been issued along the northern Gulf Coast from Morgan City, La., to Destin, Fla., including New Orleans and coastal Mississippi. Tornado warnings were issued for southern Florida late Sunday as a result of the rotating storm. According to the National Hurricane Center, a storm surge between six and 12 feet could threaten the northern Gulf Coast if the storm makes landfall during high tide. The storm surge in Tampa Bay--the site of the Republican Convention--could be as high as four feet, forecasters said. 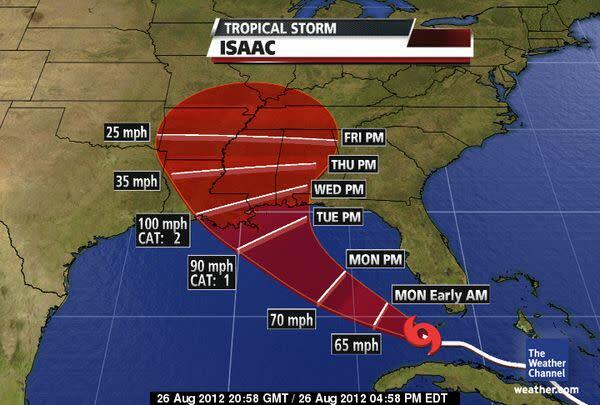 In Haiti, at least six deaths were reported on Saturday as a result of Isaac. According to Florida Gov. Rick Scott, no deaths have been reported in the state thus far. But on the eve of the seventh anniversary of Katrina, some weather experts are nonetheless growing weary. Brendan Loy, a blogger who predicted Katrina would be "an unprecedented cataclysm" in New Orleans, "breaching the Lake Pontchartrain levees" and causing thousands of deaths, says he had "a profound sense of déjà vu" on Saturday when computer models showed a "sudden westward" shift--and Isaac taking dead aim at New Orleans. "It feels like August 26, 2005—a defining day of my decade—all over again," he wrote.